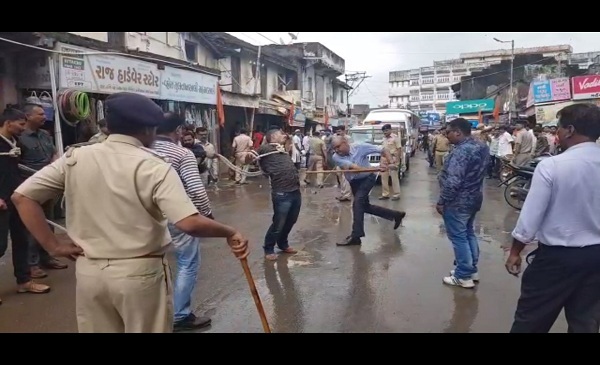 A viral video showing a plain-clothes policeman publicly parade and thrash three men restrained by ropes, is from Talaja town in Bhavnagar, Gujarat. The incident took place last week. Several readers of BOOM sent us the below video on WhatsApp asking us to verify it. BOOM contacted a local reporter from Gujarat who said that one of the three men in the video is Shailesh Dhandhaliya, a notorious gangster from Bhavnagar who is a history-sheeter with cases registered against him for extortion, robbery and kidnapping. BOOM found that the plain-clothes policeman in the video beating the accused with a laathi is Deepak Mishra, police inspector, Crime Branch, Bhavnagar. A local news website Desh Gujarat reported about the incident with a second video which shows Mishra addressing a crowd and asking them, “Not to be scared of these gangsters” while pointing at the three accused who are made to sit on the road with their hands tied behind their back. In the second video, Mishra also warns “other gangsters of Talaja that they will also be treated the same way.” Mishra’s speech is met with a roaring applause from the many locals gathered to watch the spectacle. 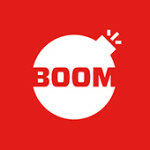 BOOM contacted Deepak Mishra who confirmed that the policeman in the video is him and said that he paraded the three accused on the streets of Talaja. He said that the public parade was done to “rid the public of fear.” He explained that the arrested accused Dhandhaliya who is a feared gangster in the area and was released a few months ago after serving 10 years jail time. The Ahmedabad police recently arrested him for another offence and handed him over to Bhavnagar crime branch as the offence was registered with them. The Bhavanagar police brought him back to Talaja and publicly paraded him and two other members of his gang and also beat them up with laathis in full public view. 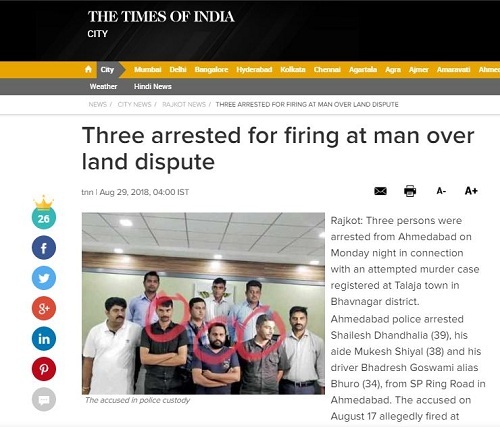 Ahmedabad police arrested Shailesh Dhandhaliya, his aide Mukesh Shiyal and his driver Bhadresh Goswami alias Bhuro on August 17, 2018 in connection with an attempted murder case registered at Talaja town in Bhavnagar district, the Times of India reported. “Yes, I paraded him and his accomplices in public to show the residents of Talaja that they have nothing to fear. He is a dreaded gangster and the public are very scared of him. I did it for the public good,” Deepak Mishra told BOOM. Mishra even shared photos of the incident on his Facebook page after a local Gujarati news magazine Police Pothi posted it online. Many comments on the post applauded Mishra calling him, “Singham” – a character in a Hindi movie of the same name where the protagonist is an honest cop who does not always play by the book. BOOM reached out to Pravin Mal, Superintendent of Police who said he was not aware of the incident and calls to Shivanand Jha, Director General of Police, Gujarat went unanswered at the time of publishing the story.